Note from Lubos at slovakcooking.com: I got an email few days ago from Matt Millensifer, who not too long ago started a website dedicated to meat grinders, grindrxl.com. He wanted to share some tips with you, and since grinding meat is such a huge part of traditional Slovak cooking, I thought this was quite fitting. By the way, I have not yet ordered anything from him, but he seems like a really nice guy and a good contact in case you are looking for meat grinders or meat grinder tips. Since most of you are avid followers of slovakcooking.com, my guess is that you are preparing to celebrate zabíjačka. Since most of you will also use a meat grinder to prepare homemade sausages at this age old tradition, I thought it would be fitting to remind you of a few tips necessary to not only ensure that you get a good grind, but also stay safe and keep it sanitary. The popular #10 meat grinder and a meat grinder cleaning kit. Images courtesy of Matt. Fine: used for breakfast sausages, spreads, pâtés, baby food, and hamburgers. Medium: used for Polish and Italian style sausages, ground meat in soups or relishes. Coarse: used for salami and larger style sausages, ground meat for chili or with vegetables. Preparing the meat – One area people typically neglect is preparing their meat to be run through a grinder. There are a couple of important things to remember here. First, you need to make sure that the meat is chilled throughout the process. This will not only allow the meat to run through the grinder much easier (without mashing), but will also ensure that the meat is sanitary. Second, you need to trim away as much of the excess fat, cartilage, and tendons as possible so your machine doesn’t clog up. Though you will need to stop a couple of times and clean your machine while you grind, this will be much easier if you prepare in advance. Set up the grinder You always want to be sure that your grinder is mounted to a stable surface. Once you have mounted the grinder, be sure to rock it back and forth to ensure that your grinder will stay in place. Grind only the meat Try not to grind items that aren’t recommended for the grinder. I know this seems like an obvious point, but you have no idea how often this issue comes up. Grinding bones, dry food, etc. will dull your blades and could possibly ruin the unit. Stopping to clean the grinder – when you stop to open up the grinder and clean it, make sure you remove any tendons, bones, and gristle so your unit will continue to run smoothly. Once again, neglecting to do this will severely decrease the lifespan of your grinder. A nice trick is to run a few slices of bread through your grinder to clean it. This will pull out all the excess junk that is hard to reach. Cleaning Once you are finished with your grinding (and stuffing), be sure to disassemble the unit and clean the grinder with antibacterial soap and water. You’re asking for trouble down the road if you don’t clean your grinder thoroughly. Also, remember to completely dry your grinder once you are done cleaning it. If you don’t, your grinder will rust. Another nice trick is to store the grinder in a bag with rice. The rice will absorb the excess water, keeping the unit dry. The most important factor in extending the life of a meat grinder is cleanliness and maintenance. Follow these steps, and your grinder will last you for years! Happy zabíjačka everyone! Bio: Matt Millensifer is an outdoor enthusiast who lives in the Idaho and loves golf, hunting, college football, and spending time with his family. Growing up around hunting and game processing, grindrxl.com became a dream realized in 2011. His website specializes in meat grinders and meat grinder accessories. For more information on meat grinders or general questions please email him at msiferllc@gmail.com. OMG, I am in hogs heaven. 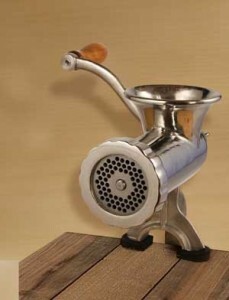 OMG, that what a grinder is suppose to do! Of course I also use it to grind my beef liver to make a beef liver dumplings for my soups. Trying to find out a recepe our family always had around the holidays. Was always called Eternichky, A fine ground sausage with barley. What is the correct name and can you make it yourself. Excellent picture, with a set of devices for cleaning the mincer. We often do not think that needs its own brush grinder. Proper guideline of using your product and its effectiveness attracted ma to buy your product.Great Job Done! Proper guideline of using your product and its effectiveness attracted me to buy your product.Great Job Done! Great tips to handle a meat grinder. All these makes you easy to use it and handle it. Great tips for grinding meat with a meat grinder. 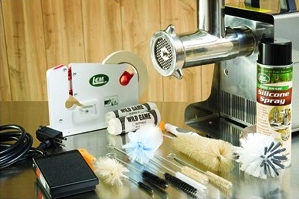 Meat grinders are available with electric and manual operation options. Both come in different sizes. The product size and motor of electric models only determines product weight. The size limits where you store the grinder when not in use. The hopper size, type of metal such as stainless steel or iron, horsepower (hp) of the motor increases the weight and size of an electric meat grinder of many models. A manual model uses a handle to move the auger. The size of the hopper and whether the grinder is a clamped-on or a bolt-down model determines the size of a manual grinder. Whether you complete grinding jobs at home for farm or game meat, you should consider the power necessary to complete the task in a dependable way to add spices and seasonings to suit their tastes.